Today is Day Two. 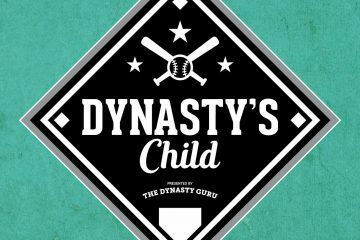 Over the next 30 days, this site will be dedicated almost solely to the task at hand – the 2013 Dynasty League Rankings. If you’re looking for background on both the content you should expect and the dates you should expect them, check out the 2013 rankings homepage. And we’re kicking off the month-long project with the list that I’ve gotten the most questions about since the off-season started. The only difference between the original schedule and what you’ll see this week is that I’ve broken the Top 150 out into five parts, not three. Each day of the week, you’ll get thirty more guys until we culminate Friday with #1. The biggest breakout star of the Mariners’ farm system in 2012, Maurer finally stayed healthy and showed off his impressive three-pitch mix. However, he’ll need to keep showing it as his 137 1/3 IP in 2012 was nearly as much as he threw from 2008 to 2011 (185 1/3 IP). #TheLegend needs to learn a lot more plate discipline, but the raw tools he has are very rare among catchers. He’s still a low percentage prospect, but if he clicks offensively, he could hit 30+ HR in Arlington with enough athleticism to contribute on the basepaths as well (7 SB in 74 games last season). Odor is a gamer in almost every sense of the word. He’s small (5’11”, 170 lbs dripping wet) and he doesn’t have loud tools, but he did hit .259/.313/.400 with 10 HR and 19 SB in the Sally League as an 18-year old – and was even more impressive before he tired towards the end of the year. It’s kind of sad when you’re a team’s top prospect and you can’t even crack the top-100. That’s no knock on Biddle though, who impressed in the Florida State League with a 3.22 ERA and 151 K in 142 2/3 innings. But then again, FSL success is nothing new for Philadelphia pitching prospects. The youngest player on this list, Mondesi won’t turn 18 until July of 2013. He more than held his own in the Pioneer League this year, and he has major league bloodlines (he’s Raul Mondesi’s son). He is forever away, but a potentially special player. Don’t be shocked if the Royals continue to be aggressive with him by sending him to the Midwest League as a 17-year old. When the Giants take a pitcher in the first round of the draft, you pay attention. And not just because they’re going to be in a favorable park, it’s because of the track record. From 2002-2011, they took six pitchers in the first round, and that group includes Cain, Lincecum, Bumgarner and Wheeler. Stratton is a little old for his class, and offers little projection, but has the makings of three plus pitches and should be on the fast track. Oh, what to do with Brett Jackson? He looks the part, and if you didn’t notice his 158 K in 407 Triple-A at bats, you’d think he would be a very solid prospect. But his swing-and-miss issues are well established and the Cubs are overhauling his swing in hopes that the rest of his game (power/speed) can work at the major league level. There’s no denying the hit tool of Brad Miller, it’s just a matter of what it comes with. Another Clemson product, Miller was taken in the second round of the 2011 draft and has done nothing but hit. So even though he will likely max out at around 10 HR and doesn’t project to steal more than around 15-20 bases, a potential .300 hitting SS certainly has value. There may not have been a more dominant 2012 pro debut from a pitcher than Wacha had – across Rookie-league ball, High-A and Double-A, Wacha had a 0.86 ERA, 0.57 WHIP and 40 K in 21 IP. The reason he’s not higher on the list is that it was all in short (2-3 inning) stints and he was polished coming out of college. There’s not a ton of upside with Heaney, as he was more or less a finished product coming out of Oklahoma State, but he could be a back-end starter right now with room for growth. With a low-90’s fastball and a curveball which can legitimately miss bats, Heaney just needs to refine his change-up to be a solid #3 starter. I can’t help Mike Minor from coming to mind when I think about Heaney. This year’s forgotten man of the Padres farm system, Ross missed most of the season with an elbow injury. However, he still has the same #2 SP upside with a plus fastball and two potential above-average off-speed pitches. He’s one to watch closely in 2013, but he’s got to stay on the field. The first selection of the 2012 supplemental first round, Berrios came out like gangbusters after he signed, with a 1.17 ERA, 0.62 WHIP and 49-4 K/BB rate in 30 2/3 IP. He’s not higher on the list because he doesn’t offer a ton of projection and he’s only 6’0” – so we’re likely looking at a #3 starter, not an ace. After being taken 25th overall selection in the 2012 draft out of Clemson University (noticing a pattern here? ), Shaffer hit reasonably well in his pro debut in the NYPL (.308/.406/.487 with 4 HR in 117 AB). He was a late riser on draft boards last spring and projects to be a .280 with 25 HR type of bat who should be able to stay at 3B. Advertised as a super raw and toolsy OF in the 2012 draft, Brinson actually surprised many with his performance in the AZL – hitting .283/.345/.523 with 7 HR, 36 XBH and 14 SB in 237 AB. The fact that his 74-21 K/BB rate in 237 AB was considered a pleasant surprise tells you exactly where he has his work cut out for him in order to advance as a hitter. His upside remains as high as nearly anyone in his draft class. Graham really used the 2012 season as his introduction on the prospect stage. A 4th rounder in 2011 out of Santa Clara University, he pitched well in the Appy League, but was old for the level. This year, he showed his mettle in age-appropriate High-A and Double-A with a 2.80 ERA and 110 K in 148 IP, while showing strong ability to keep the ball on the ground. Graham also turned 23 yesterday, so wish the man a belated happy birthday. If you could combine Austin Hedges’ defensive prowess and Trahan’s bat, you’d have a Voltron-style super catching prospect. But you can’t. Let’s get on this, science. And although scouts have real doubts about his ability to stay behind the plate, Trahan’s bat could play anywhere. This could be another Wil Myers situation where the Diamondbacks just decide to preemptively stick him somewhere else to let his bat and athleticism prosper. Like the Phillies before them, the White Sox top out with a player just outside the top-100. Hawkins made it up three levels to High-A by the end of 2012 and shows plus raw power with better hitting ability than you’d expect. On the other side, some scouts are worried about his body type, which is already large and getting larger. A prospect who strong exhibits all three characteristics I look for in a pitcher (strikeouts, walks and ground balls), Blackburn was the subject of a post earlier this year – which you can read here. He has less upside than his stats suggest, but his floor is as high as anyone in the back third of this list. It wasn’t a great year for Lee, as he accumulated a 4.39 ERA in 121 IP between High-A and Double-A with 103 strikeouts and 129 hits allowed. The issue with Lee still isn’t what he is, it’s what he’s not. There is a perception out there that Lee is a front-line starter (and I still don’t know where that comes from), but we’re realistically looking at a very solid #3/4 if things break right. It’s not terribly often that a player who is on the previous season’s World Series roster is still able to be counted on prospect lists, but Garcia only accumulated 47 AB in 2012 with Detroit. His overall line of .299/.333/.455 with 14 HR and 23 SB shows his promise and his troubles. Garcia has all the tools you’d be looking for in a future RF, but only time will tell whether his plate discipline issues (he’s never walked more than 20 times in a minor league season) will allow those tools to play up. I could just copy and paste what I’ve thought about Perez for the past two seasons, as they still hold true. He’s still much younger than everyone thinks (he won’t turn 22 until April 4) and his performance is still frustrating. Perez is also still far too hittable for the stuff he has, as he allowed 122 hits in 127 Triple-A innings and then 47 hits in 38 MLB innings. But despite that, I just can’t quit him – there’s still a potential #2/3 starter in that left arm of his. In Jeff Luhnow I trust. In his last three years overseeing the Cardinals draft, Luhnow took five hard-throwing righties within the first 100 picks: Shelby Miller, Joe Kelly, Seth Blair, Tyrell Jenkins and Jordan Swagerty (plus, Trevor Rosenthal 639th overall in 2009). McCullers went 40th overall in the 2012 and is a hard-throwing righty. Cole was taken in the 4th round of the 2010 draft as an arm-strength bet, and in some ways, he still is one. After getting hammered in the Cal League (7.82 ERA in 38 IP), he was demoted, but settled back down to be even more impressive than his first stint in Low-A (2.07 ERA and 102-19 K/BB rate in 95 2/3 IP). He’ll get another taste of Stockton to start 2013, and only time will tell as to whether or not he’s going to take that next step forward and establish himself as a top-flight pitching prospect. Don’t forget about Vizcaino, who is currently recovering from Tommy John surgery. A part of the trade which sent Paul Maholm to Atlanta, he is an electric arm with a mid-90’s fastball and quick curveball, which is an out pitch right now (well not right now as he’s still recovering from surgery). This ranking is a hedge until we know how the Cubs will treat him – if he’s a starter, he’s closer to the top-50, but if he’s a reliever, he’s closer to Mark Montgomery towards the back of the list. The stats aren’t quite there yet for Bonifacio, but the scouting reports on him are both encouraging and exciting. During the first half of the season, he hit .314/.369/.469 as mostly an 18-year old in the Midwest League before limping to the finish line. Right now, he’s getting by almost entirely on his contact ability, as he’s squaring up balls, but not yet driving them for power. If he can develop that, there’s 25-30 HR potential in his bat. For the first three months of the 2012 season, Choice was a power hitting prospect without the power. When June ended, he had 6 HR in 297 AB at Double-A. 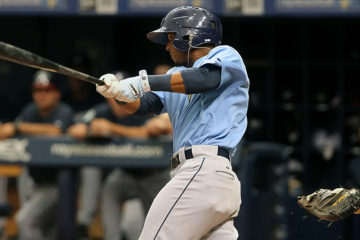 But he caught fire in July (.435/.493/.710) before fracturing his hand, which ended his season. Choice will start 2013 at Triple-A and hopes to pick up where he left off last July, and if he does, the glut of mediocre outfielders in Oakland won’t stand in his way. If you catch Cosart on the right day, you could be convinced that you’re looking at one of the top pitching prospects in all of baseball. If you catch him on the wrong day, you might wonder how he even made it to Triple-A. There’s such a wide gap between what Cosart is and what he could be, that it’s very tough to rank him. But while he doesn’t have a great shot at sticking in the rotation, he could be an absolutely dominant reliever with two plus-plus pitches in his fastball and hard curve. Adams was given an 86 AB sample of major league pitching in 2012, but struggled to adjust, hitting .244/.286/.384 – a far cry from his .329/.362/.624 line in Triple-A. The fact that he’s ranked this highly should show you which line I think is more representative of his skill level. However, Adams is just flat out in the wrong organization. With Allen Craig and Matt Carpenter ahead of him on the depth chart at the moment, he may need a trade to show he’s not a Quad-A player. The ultimate 2012 pop up prospect, Straily took the minor leagues by storm by impressing in the Texas League (3.38 ERA with 108 K in 85 1/3 IP) and then flat-out dominating in the PCL (2.03 ERA with 82 K in 66 2/3 IP). He even received 7 starts in Oakland, going 2-1 with a 3.89 ERA, 1.32 WHIP and 32 K in 39 1/3 innings. But despite those gaudy numbers, Straily is not a dominating pitcher by any means. He has a low 90’s fastball, with plus command and average off-speed offerings – so this is more of a mid-rotation starter if his 2012 improvement sticks. Talk about making a statement. Cingrani was the closer at Rice the spring prior to being drafted in the 3rd round as a senior. The Reds decided to put him in the rotation and he just exploded. First he put up a 1.11 ERA and 71 K in 56 2/3 innings in the Cal League (! ), and the followed that with a 2.12 ERA and 101 K in 89 1/3 innings at Double-A. To cap it off, he struck out 9 in 5 major league innings down the stretch. The jury is still out on whether Cingrani will stick as a starter, but even if he doesn’t, he can be a shutdown reliever. Site is amazing, really enjoying it.